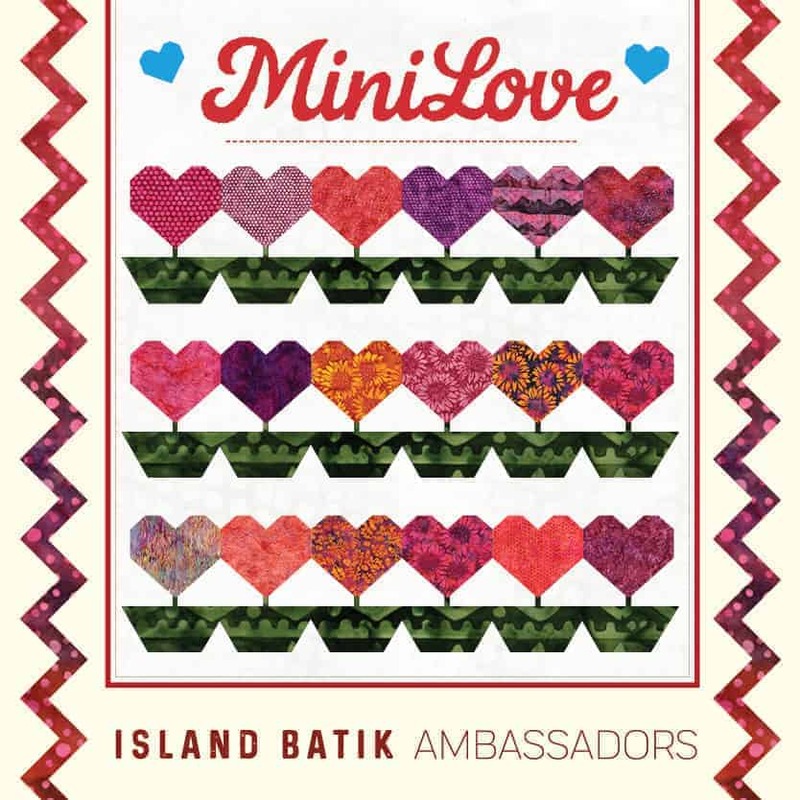 Island Batik Ambassadors had two assignments our first month (Island Batik provided the fabrics for this mini quilt). Minis area so much fun – they are fast. You can hang them or use them on a table as an accent. Having just downsized to an apartment, I have a little more wall space! So some of my minis are hanging on a closet door and some hanging on sides of my storage unit. The requirements were fairly simple. 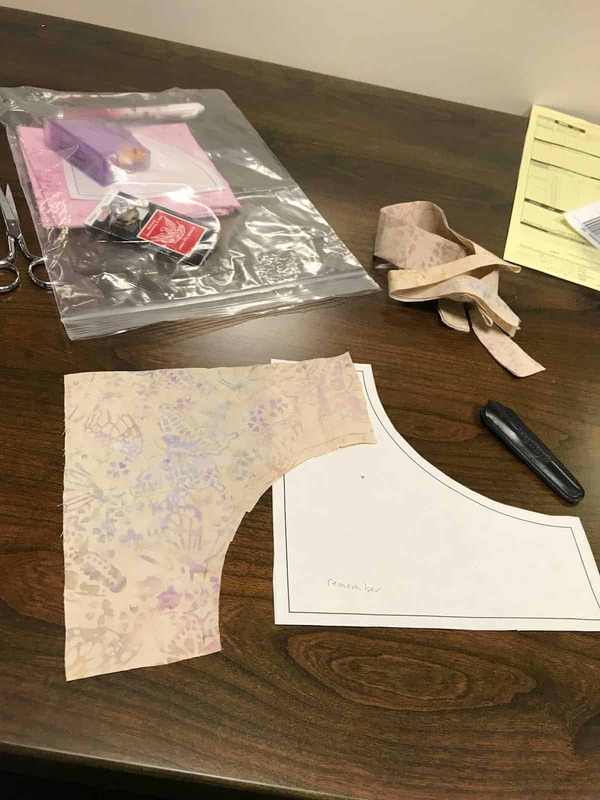 Less than 24″ on a side, use any fabric except our surprise fabric, and any design and post any day. Today’s mini is an adaptation of an Amish Hex sign. I grew up in Reading, Pennsylvania where there are many Amish and Mennonite communities. 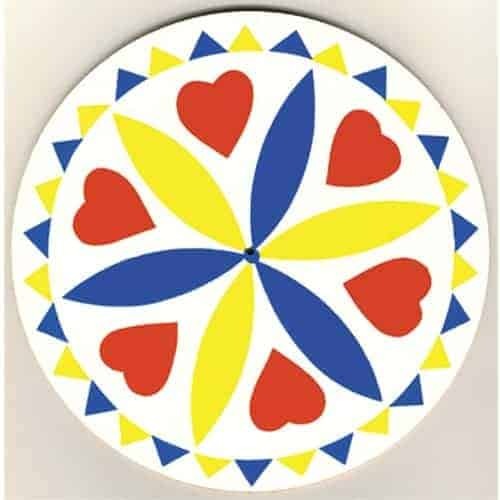 I loved seeing the hex signs, which are traditionally a sign of welcome and many had hearts on them. I haven’t always loved the colors, so I thought why not do it my own way. 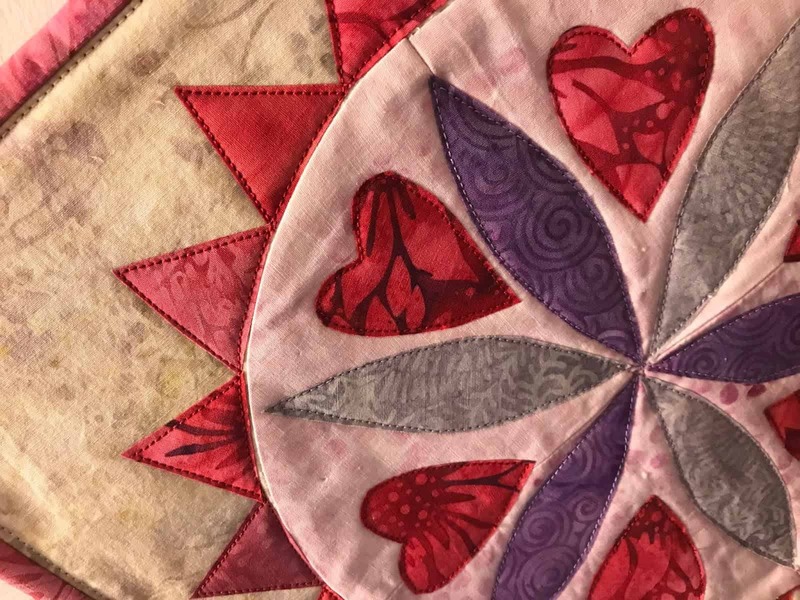 Hearts – mini love – batiks – my home town melded into this little quilt. I did a little work in EQ8 to see what I could do. Two problems arose – time and not enough of the background to make larger pieces. What to do…. 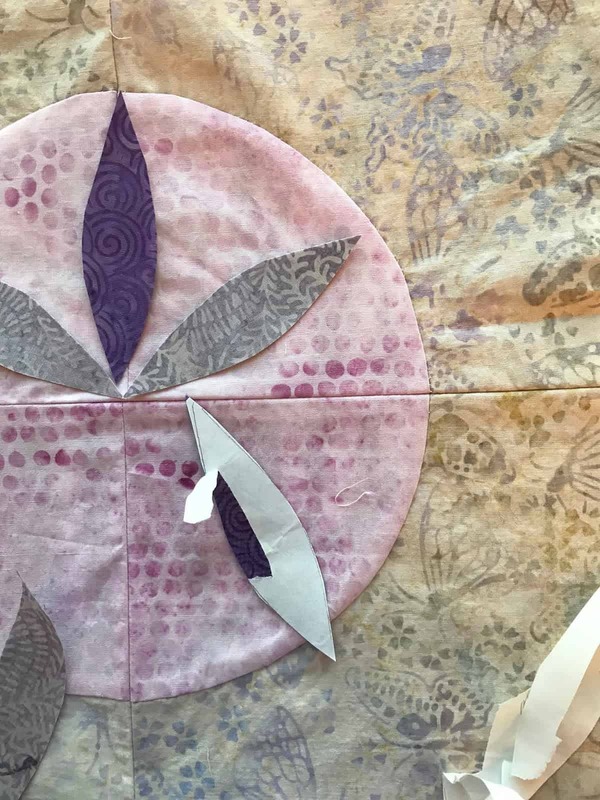 AH – make a drunkards path to get the circle – which could use the fabric I choose. Furthermore, I could solve problem two by hand-piece while waiting for furniture fabricators to finish up a job. Brilliant! The rest was easy. 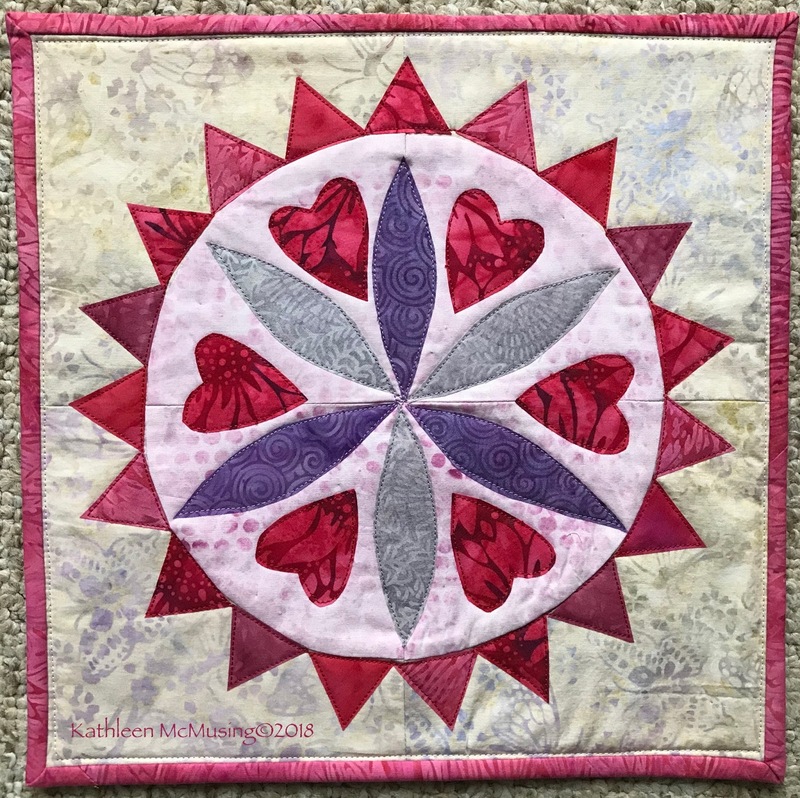 I did do machine appliqué as my quilting – again a time saver for this project. Up next for Island Batik projects: A new technique for me and a rep sample of our secret fabric. Previous Post Galentine’s Day is February 13th! 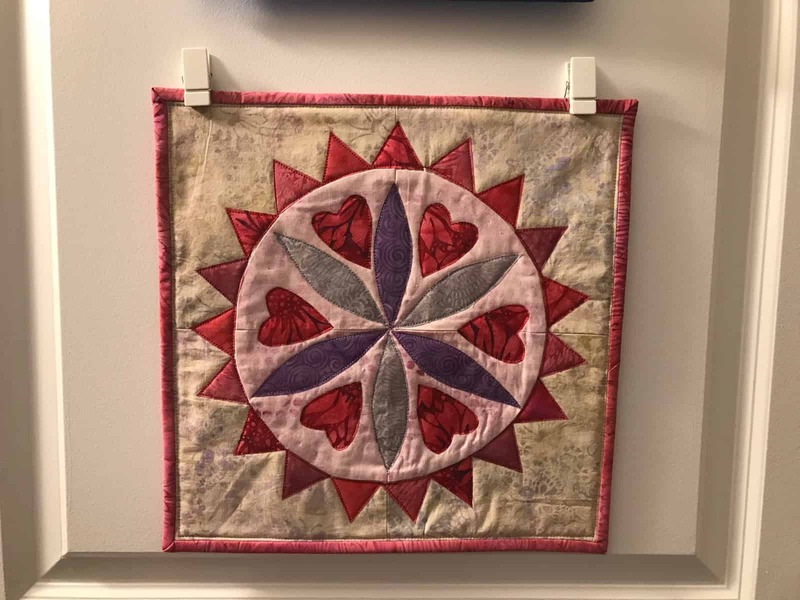 Very pretty, and it was so informative to read about how you solved your problems in making this quilt. I really love the results! Thank you, Pamela. It was a challenge…now on to finish up my other projects. Love the colors in your version! It's adorbs!!! I love how versatile and moveable minis are, too. Thank you, Nancy. I never like the Amish colors – but this makes my heart sing. This is a really neat little quilt with all your hometown memories in it. 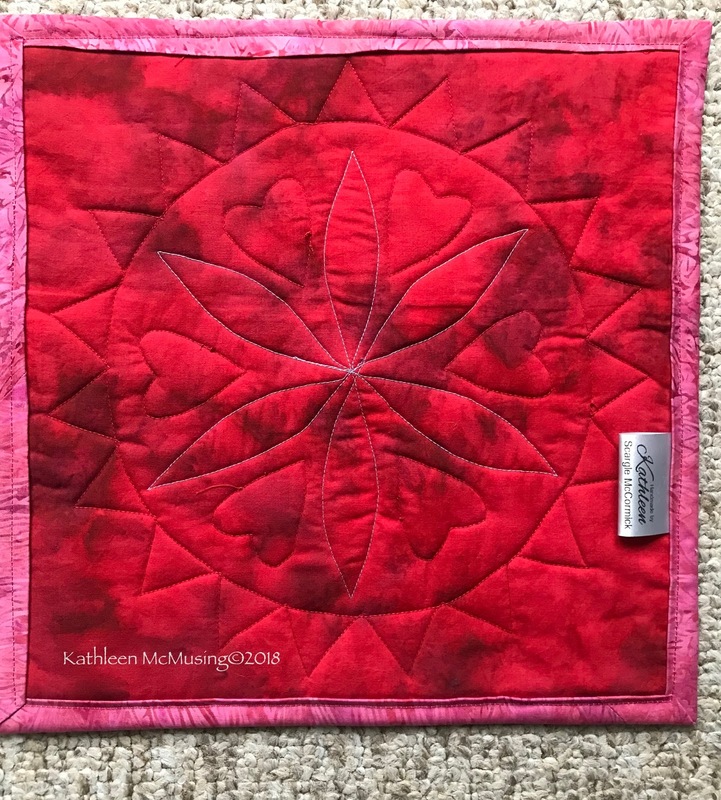 I love to make mini quilts; I think it must be the "instant" gratification thing. Larger quilts are fun to make, but I work and live in limited space. I can only have so many around the house. Mini quilts always find a space, or they make a great gift! Looking forward to seeing your next IB project! Totally love the instant gratification! Space is a problem, so I am loving my little Command Strip Clips on my doors/cabinets. I haven't quite decided on the technique – that's the next order of business. I love your version in your colours. And how you have incorporated meaning from your own past. Beautiful. Thanks, Dione. It became a fun little project. Kathleen, I love these minis. Thanks, Gail. It was really fun! Very interesting post and full of details which were sort of missing with your Instagram post where you mentioned you were waiting for Men–that got my attention–ha ha. You are having fun being an Ambassador aren't you. You are funny! I was trying to promote some interest apparently it worked. I am having fun, and now to decide the next project. My contract work is winding down next week and hope to finish my OMG but I don’t know. And thanks for linking to the Tips and Tutorials Festival! Thanks for stopping by, Alison. I am rather proud of that block. Thank you, I had a lot of fun making it. Thanks, Robin. I do those hex signs but I love them in more contemporary colors – or at least a jewel tone palette. I may sell it at some point so I am glad you were able to download it.